Blood is a specialized body fluid that delivers essential substances such as nutrients and oxygen to the cells of the body and transports waste products away from those same cells. Blood accounts for approximately 7% of human body weight and the average adult has a blood volume of about 5 litres. It is composed of blood cells suspended in a liquid called plasma (55% of blood volume). Blood is mainly made up of red blood cells (erythrocytes), white blood cells (leucocytes) and platelets. Supply of oxygen to tissues - Red blood cells contain haemoglobin, an iron-containing protein, which transports oxygen. Supply of nutrients such as glucose, amino acids and fatty acids. Removal of waste such as carbon dioxide, urea and lactic acid. Coagulation (blood clotting), to prevent bleeding. Immunological functions, including circulation of white blood cells and detection of foreign material antibodies. Blood is a raw material from which different therapeutic products are made. 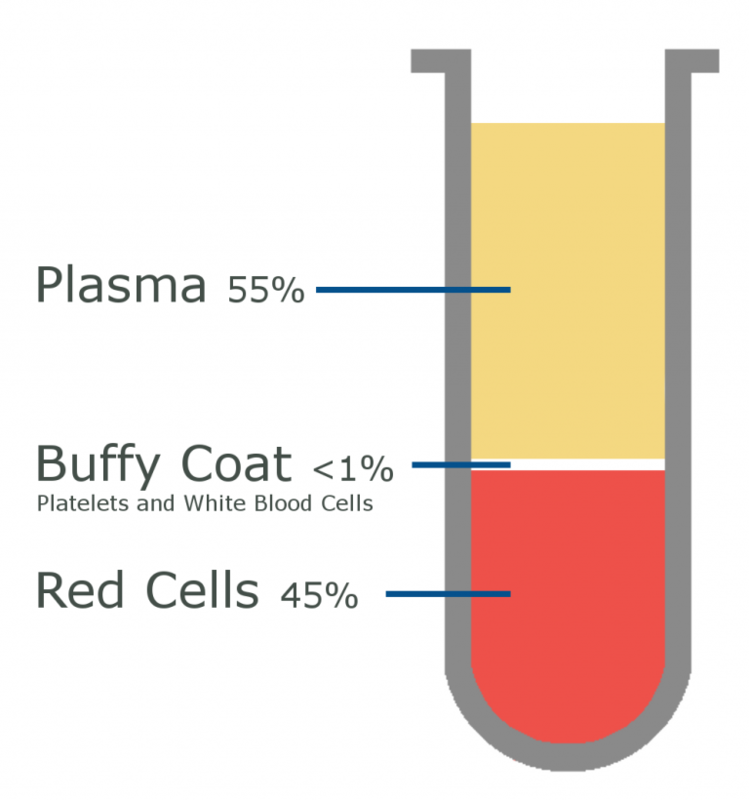 Plasma - This is the liquid part of blood and can be removed from the whole blood donation for use. It is indicated for the replacement of clotting factors in a few specific situations. It can be stored for 2 years at -25°C. Platelets - These are small cell fragments which circulate in the blood and contribute to blood clotting. Platelet transfusions are indicated for the prevention and treatment of bleeding in patients with low platelet counts or platelet function defects. Platelets are stored at room temperature for up to 5 days (or 7 days with extra testing). For more information click here. Cryoprecipitate - This is prepared by controlled thawing of frozen plasma to precipitate particular proteins important for blood clotting. Red Cells - Red cell transfusion is indicated to increase the oxygen delivering capacity of the blood when acute or chronic anaemia contributes to inadequate oxygen delivery to tissues. Red cells can be stored up to 35 days in the fridge. These are licensed pharmaceutical products are made from large pools of plasma. Coagulation factor concentrates – for patients deficient in certain clotting factors. Human immunoglobulin – replacement therapy for patients with antibody deficiency, treatment of immunological disorders, prevention of RhD immunization in RhD negative women. 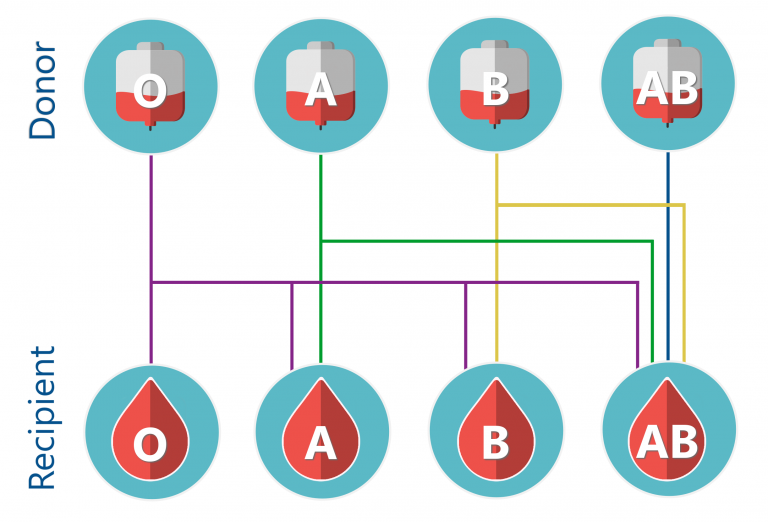 Red cell units are ABO compatible if the donor red cells are of the identical ABO group to the recipient. Red cell units with a different ABO group from that of the recipient may also be ABO compatible, as shown below. Group O red cells can be given to any patient (universal donor) as it has no antigens on the surface of the red cells. Group AB patients can receive red cells of any group (universal recipient) as their blood contains no ABO antibodies in the plasma. For more information click here.